Whether you are a professional installer or a sophisticated Home/Business DIY’er, you will have certainly experienced your share of WiFi-woes. You might have lightning fast Broadband arriving at your doorstep, but can the WiFi and Ethernet network inside cope? More Internet connected things creates network demand within a property. Getting great connectivity throughout (e.g. WiFi in a garden office, Smart TV in a loft/cellar conversion) is challenging. Within a business environment, you will more often than not be relying on your internet connection. Losing this, is simply not an option. No Internet means no email, no web browsing and in many cases, no work. And, while your connection remains down money is being lost by the second. It is all too common that administrators hope for the best, and this is in no way the best plan of action. It makes us cringe! So let’s take a quick look, the WiFi structure will no doubt differ from company to company, depending on client/ customer use and what access is required. Most commonly, your router will connect to the Internet via fixed line (ADSL, VDSL, cable) or cellular (3G/4G/LTE). With DrayTeks business class solution the ability to offer a secure hotspot is made simple, while your WiFi network can remain unaffected and perform at the levels required by the user. 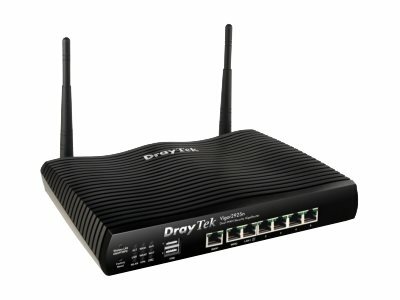 With our friends at DrayTek, we offer professional-level Routers and Access Points to deliver WiFi and Ethernet connectivity. 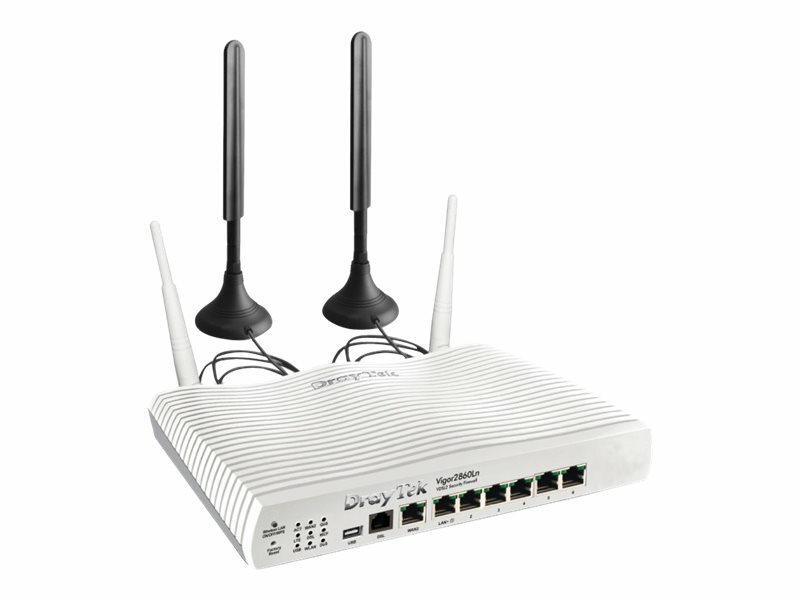 The array of features allows the administrator to use the LAN ports or Wireless network to setup QoS, CSM or Firewall to connections as they wish. The WAN interface can be used in the same way as all other WAN interfaces on the router, it can be used for VPN, remote management or port forwarding, if the network that the router is connecting to allows this. 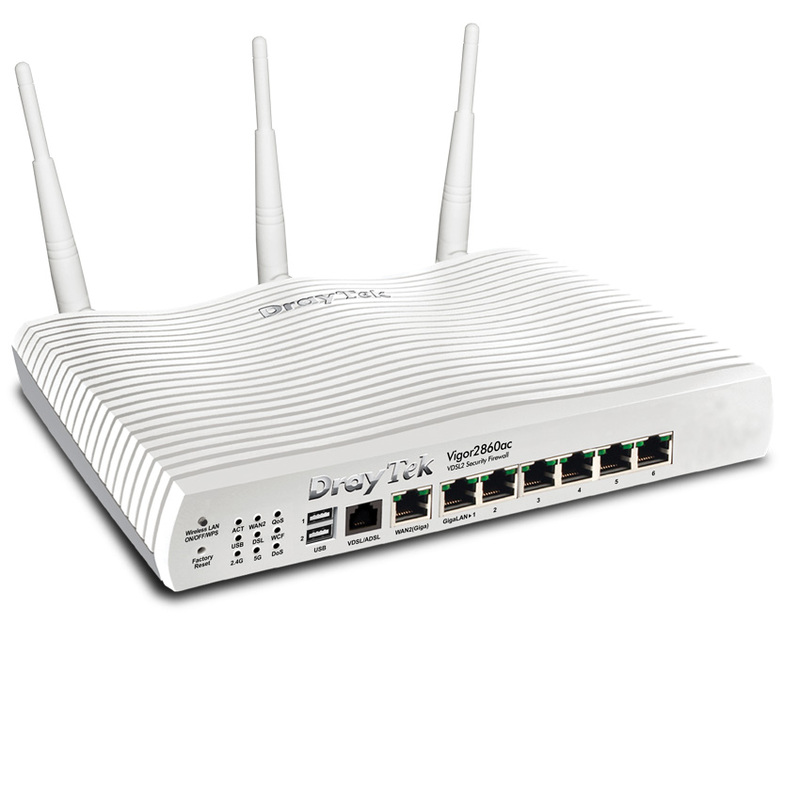 DrayTek is a robust answer to home and small business network challenges. 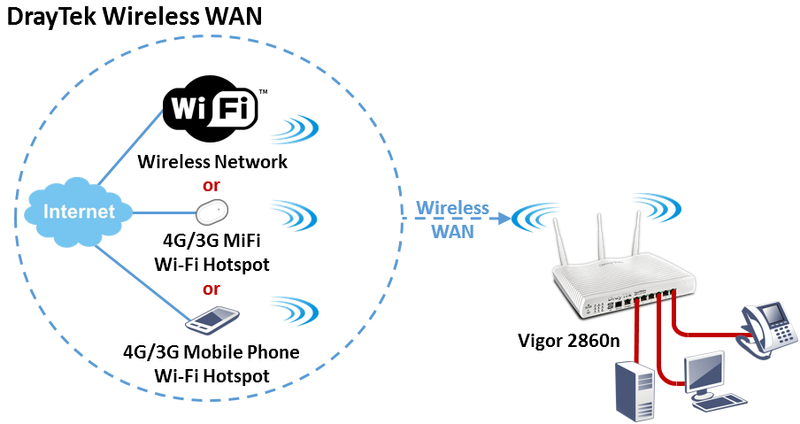 And two products that support such business class features are the Vigor 2860n and the 2925ac. 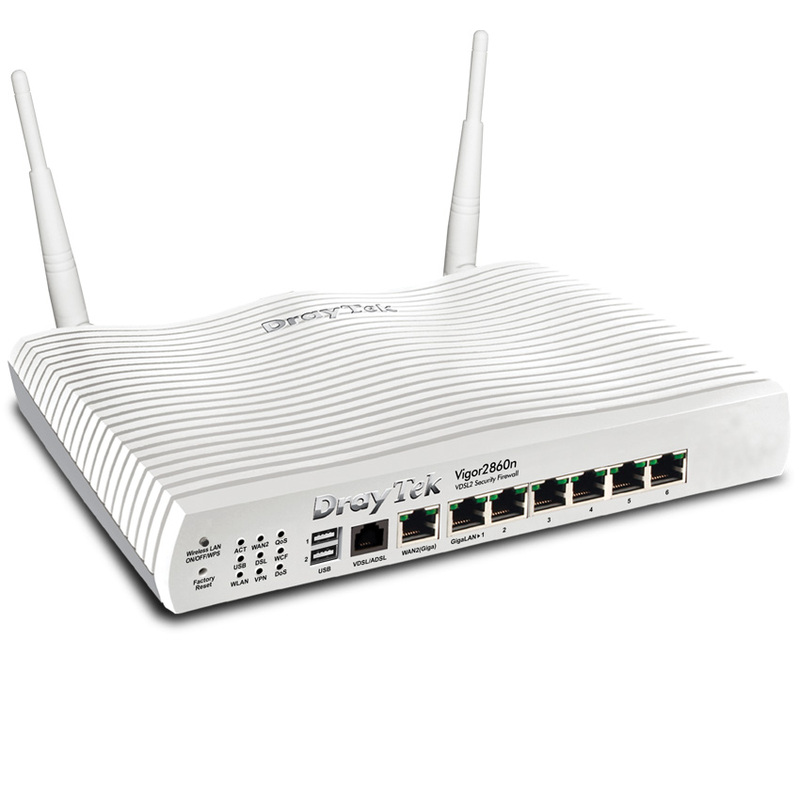 They’re great for putting secure networking exactly where needed and are easy to setup. 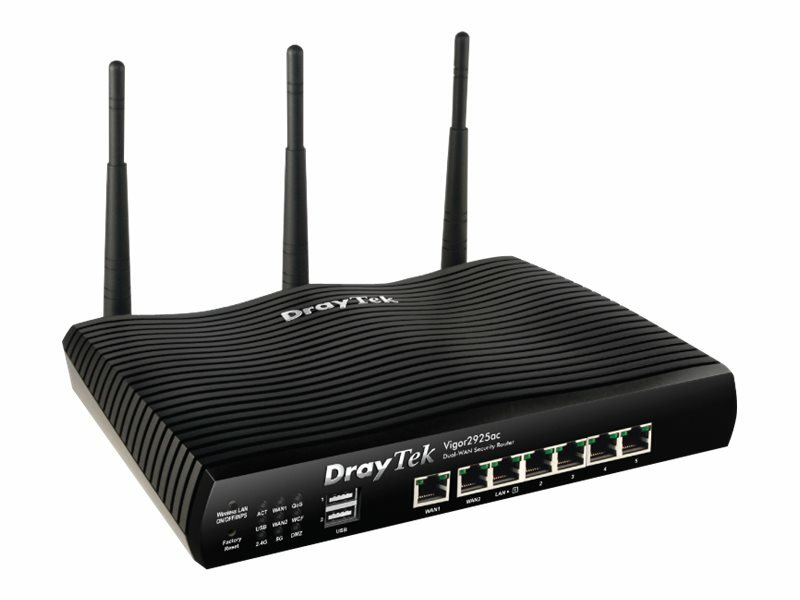 Security is always taken seriously with DrayTek routers and their firewall protects against attacks including DoS (Denial of Service) attacks, IP-based attacks and access by unauthorised remote systems. When providing services to a client, guest or staff the ability to connect to any wireless network for internet connection can allow for more productive staff, presentations and meetings. As nobody wants to be stumbling over their workload when it is out of their hands. The key feature of DrayTek’s business class solution is its ability to handle failsafes to keep a connection live even when there are issues unknown to its users in the background. How does it achieve this? Instead of using a USB connection to connect to the 3G / 4G modem, connecting via 802.11 Wi-Fi, to a wireless capable 4G hotspot device such as a MiFi, ensures compatibility even with devices that are not yet supported in firmware as USB modems. Another WiFi source of Internet connectivity is your mobile phone’s ‘tethering’ or hotspot capability. Most smart phones support this, whereby the phone uses your 3G/4G signal to create a WiFi hotspot for local devices. 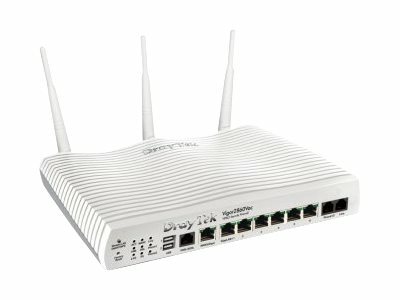 Your Vigor router can make use of that for its Internet connection. Whilst this is most often useful for temporary locations, it can also be used for emergency of failover purposes. WiFi hotspots are very common and your permanent home or office location may well already have coverage from a provider such as BT Openzone (now called BT WiFi). These three failsafes are certainly worth considering even with a reliable service. Even if you’ve never had a problem, allowing for one gives you peace of mind that you your company can, not only cope, but continue without being effected.